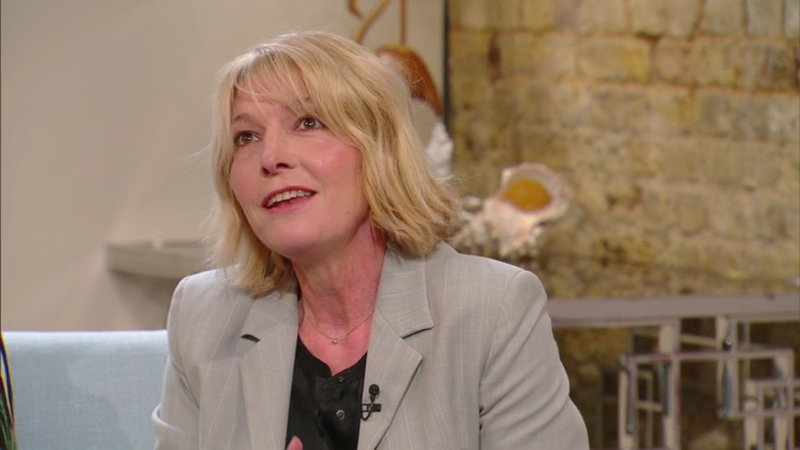 2 videos from “Doctor Who” featuring Jemma Redgrave have been added to the Video Vault. 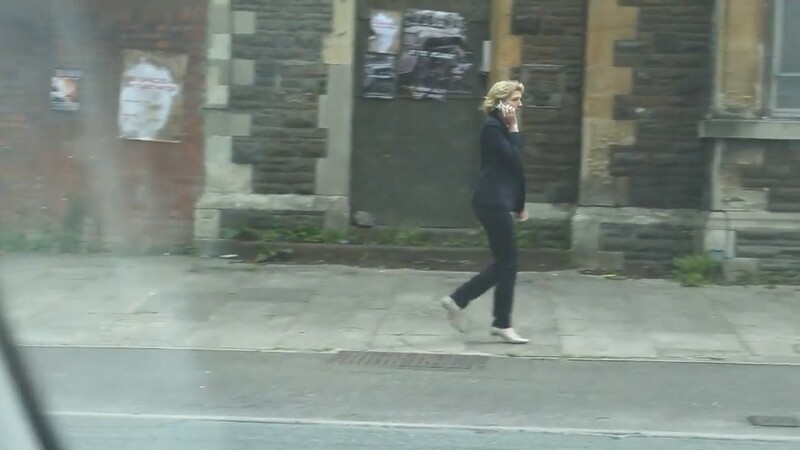 The first is a video with 2 deleted scenes from “The Zygon Invasion” and “The Zygon Inversion” and the second is a video of Jemma’s “scenes” from “The Day of the Doctor” – “Behind the Lens” feature. 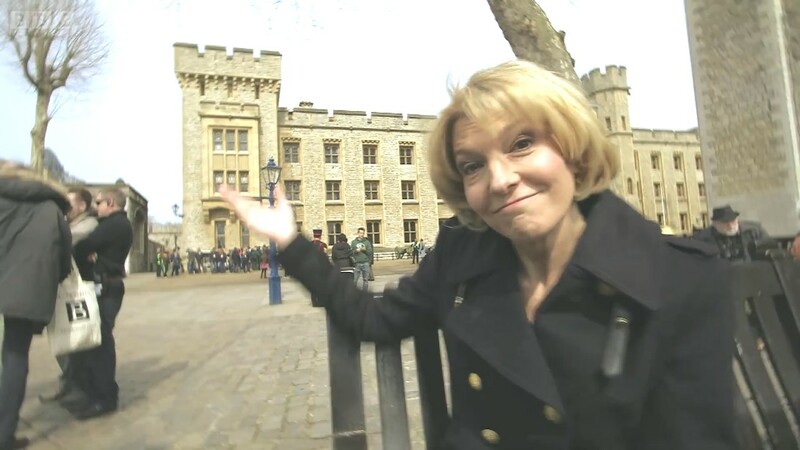 You can watch both by heading over to the “Doctor Who” section of the Video Vault. 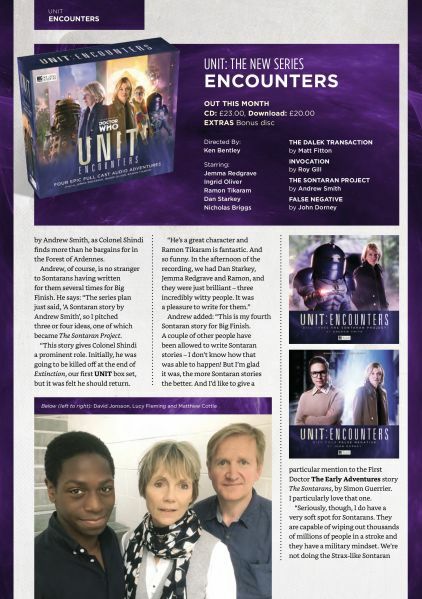 The new “Vortex” magazine from Big Finish features a preview of “UNIT: Revisitations” starring Jemma Redgrave. The boxset is due for release in November and features two “returns” from “Classic Who”. The Wirrn , from the 1975 story, “The Ark in Space” star in the two part “Hosts of the Wirrn” written by Chris Chapman. “The Ark in Space” is a pretty unforgettable story – it was Tom Baker’s second story and features his beautifully delivered “indomitable” speech. Besides, who can forget the green painted bubblewrap? “Open the Box” is written by Roy Gill and sees the return of Captain Chin Lee from the 1971 story, “The Mind of Evil”. 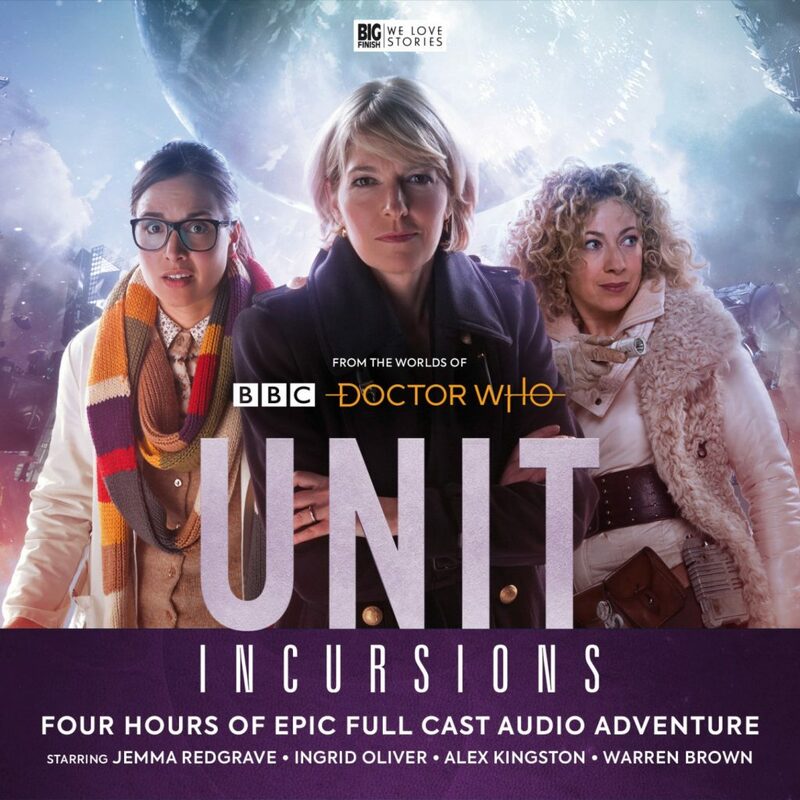 Roy Gill is responsible for the quite fabulous “Invocation” which is part of the “UNIT Encounters” boxset. Captain Chin Lee was a definite highlight of “The Mind of Evil” and it will be great to hear Pik-Sen Lim reprise her role. 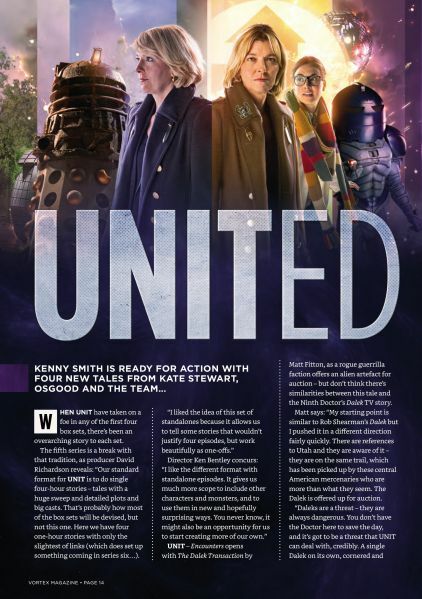 You can download the free “Vortex” magazine from Big Finish. 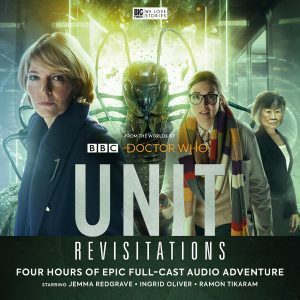 You can pre-order “UNIT Revisitations” from Big Finish priced £23 for the CD and £20 for the digital download. 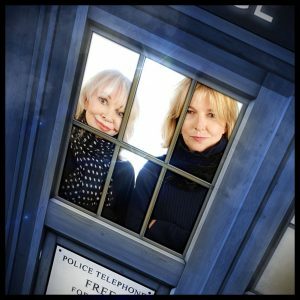 In 2019 Big Finish will celebrate 20 years of creating Doctor Who stories on audio, and it’s doing so in style with The Legacy of Time – the biggest audio crossover event ever! Six hour-long stories see characters from the entire history of Doctor Who crossing paths – some for the very first time – Classic and New Series Doctor Who will collide! Professor River Song (Alex Kingston) meets her predecessor, another time-travelling archaeologist, Professor Bernice Summerfield (Lisa Bowerman). 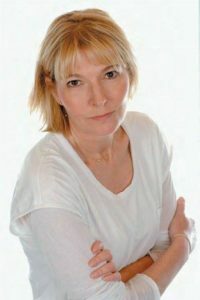 Kate Stewart (Jemma Redgrave) travels back in time to classic UNIT and meets the Third Doctor (voiced by Tim Treloar) and Jo Grant (Katy Manning). As 2018 is also the 30th anniversary year of their first appearance in Remembrance of the Daleks, the Counter-Measures team will be reunited with the Seventh Doctor (Sylvester McCoy) and Ace (Sophie Aldred). And the Sixth Doctor (Colin Baker) and his companion Charlotte Pollard (India Fisher) once again meet Detective Inspector Patricia Menzies (Anna Hope) in a police procedural like no other! Plus we go to Gallifrey, and elsewhere we enter the Time War. Doctors will meet, and there will be Easter Eggs aplenty. Time is collapsing. Incidents of temporal chaos and devastation are appearing throughout the many lives of the Doctor and his friends – fallout from one terrible disaster. The Doctor must save history itself – and he will need all the help he can get. The truth is revealed, and it will take more than one Doctor to save the day! 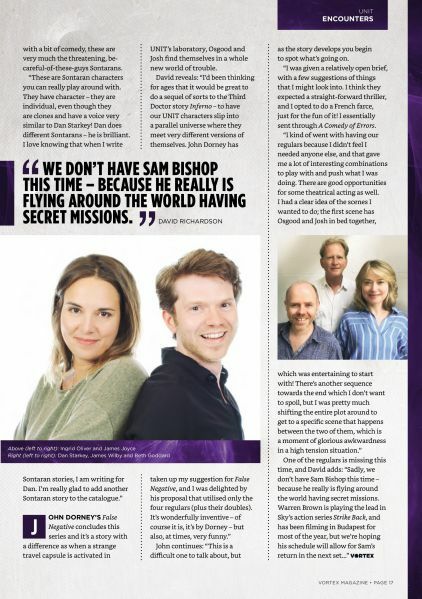 Executive Producer and one of the founding members of Big Finish, Nicholas Briggs told us about this exciting new release: “The Legacy of Time will probably go down in Big Finish history as our biggest, most exciting production, ever! 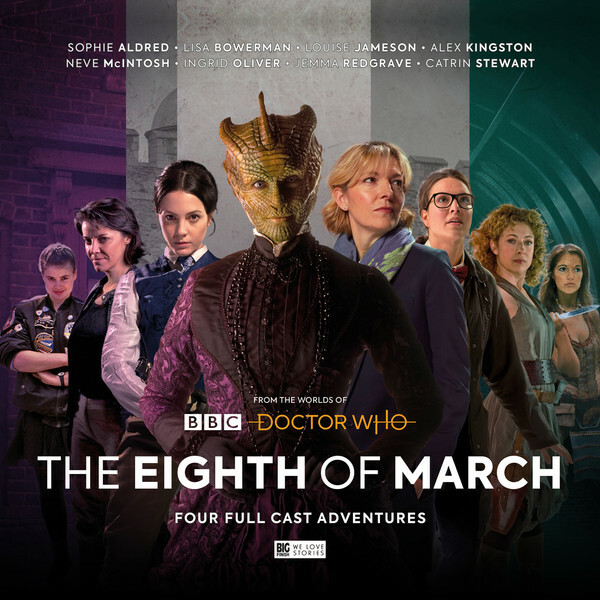 Celebrating 20 years of Doctor Who at Big Finish, it expertly pulls together all the strands from our many and varied Doctor Who ranges. “How do you celebrate 20 years of Doctor Who at Big Finish?” questions the producer assigned this epic task, David Richardson. “How do you celebrate something that has meant so much to all of us who work here – the friendships, the freedom to be creative, the glory that is Doctor Who itself? That was the challenge facing myself and Matt Fitton, but once I’d had an idea for what this six-hour epic would be about (spoilers!) it was then relatively easy to start assembling the huge team of characters and actors who would take us on the journey. Doctor Who: The Legacy of Time will be available from www.bigfinish.com on download and, as we’re one of the last audio producers and distributors still making CDs, released in an eight-disc CD set with a limited edition of just 4,000. 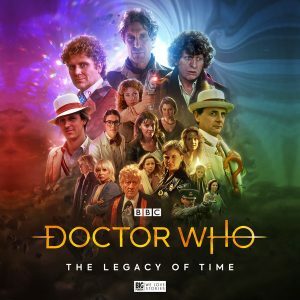 Doctor Who: The Legacy of Time will be released in July 2019, marking the 20th anniversary of Big Finish’s first Doctor Who release, The Sirens of Time. 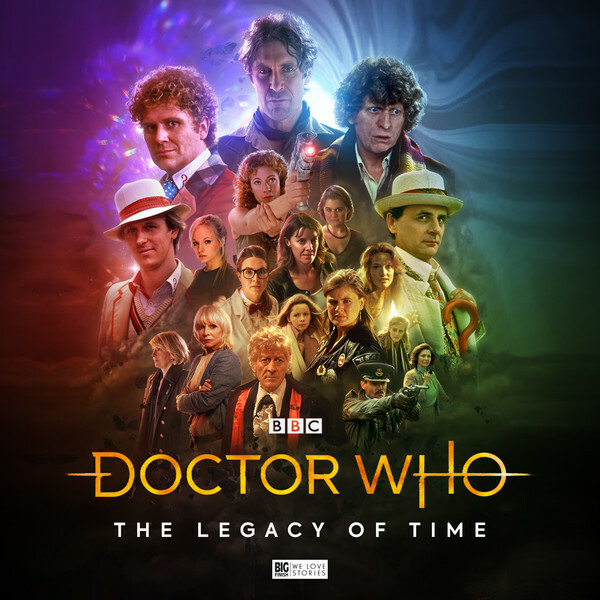 Doctor Who: The Legacy of Time will be priced at £45 on CD or £40 download, rising to £60 on CD or £55 on download on its general release. Pre-order now at Big Finish. Or you can save in a bundle with Big Finish’s special 50th anniversary of Doctor Who release, The Light at the End. Get the special editions of The Light at the End with The Legacy of Time, priced at £75 on CD or £65 on download. 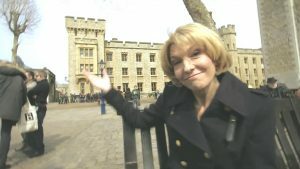 And it’s a wrap on the next series of tales for the UNIT team! 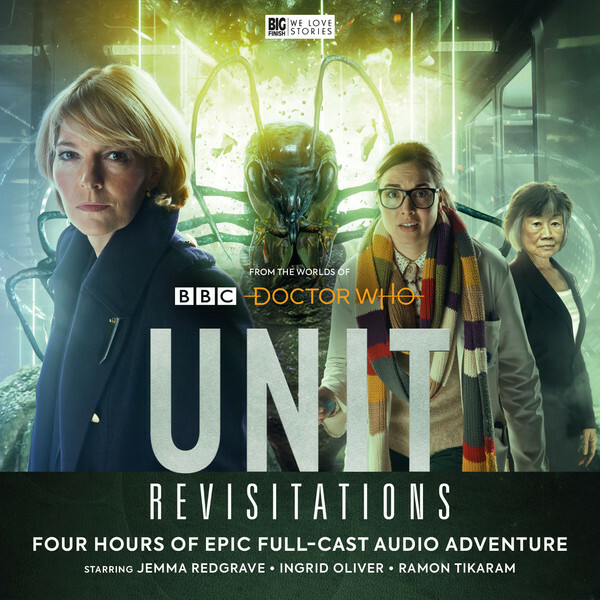 After saving humanity from a new alien paradigm in Cyber-Reality, the UNIT Team face more intergalactic threats in their seventh series of adventures in UNIT – Revisitations. Coming out in November this year, a couple of familiar foes are returning and UNIT is humanity’s best and only defence against them. In UNIT – Revisitations, the team are still reeling after the consequences of UNIT – Cyber-Reality – but the threats just keep on coming! This next box set finds the UNIT team fighting an incursion of the Wirrn (first seen in the Fourth Doctor television story The Ark in Space) in a tale by Chris Chapman, there’s a morality drama by David K Barnes, and the return of Pik- Sen Lim as Chin Lee (originally in the Third Doctor story The Mind of Evil), now a Doctor herself in an adventure by Roy Gill. Will we also see a return of the fearful Keller Machine? 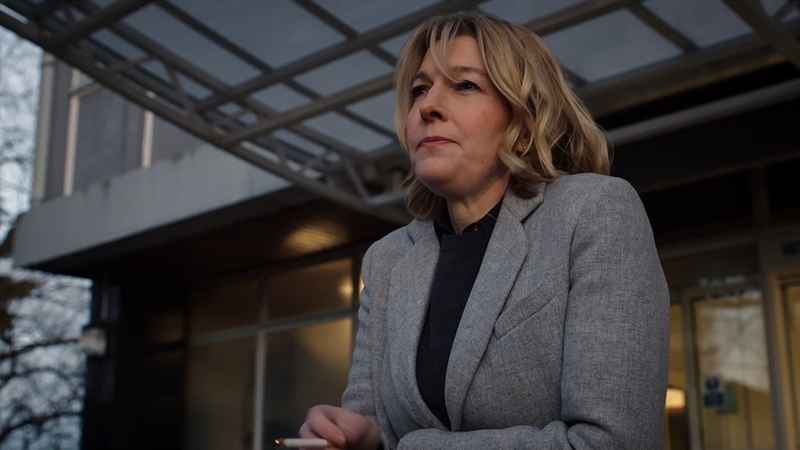 Jemma Redgrave returns as Kate Stewart, leader of UNIT, joined by Ingrid Oliver as Osgood, UNIT’s Scientific Advisor, James Joyce as Captain Josh Carter and Ramon Tikaram as Colonel Shindi. (For everyone missing Warren Brown as Sam Bishop, you can catch him in August’s box set, Lady Christina, opposite Michelle Ryan as Lady Christina de Souza). UNIT – Revisitations is available for pre-order now at £23 on CD or £20 on download. 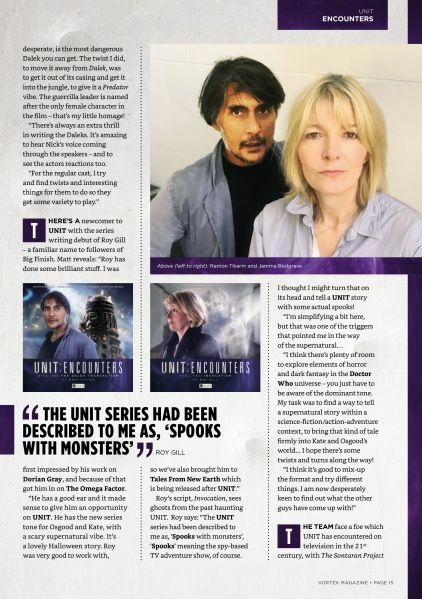 I added a new article from the Vortex Magazine which got a feature story on “UNIT: Encounters“.